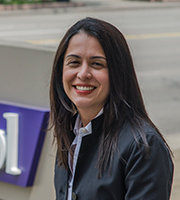 Professor Melinda S. Molina is an assistant professor at Capital University Law School. Her scholarship focuses on how the law impacts subordinate and marginalized groups in the United States. She co-authored two national studies on Latina lawyers. The first is a comprehensive nationwide examination of Latinas in the legal profession across all major legal sectors: National Study on the Status of Latinas in the Legal Profession, Few and Far Between. The second is a subsequent study of Latina public interest attorneys: La Voz de la Abogada Latina: Challenges and Rewards in Serving the Public Interest Sector. These studies are the first of its kind to provide both qualitative and quantitative data on the experiences and status of Latinas in the legal profession, on a national level, and across all major legal sectors employing a mixed method transformative design, exploring and analyzing both the formative and career-related experiences of more than 800 Latina attorneys. Before joining academia, Professor Molina was an associate in the criminal defense and investigation practice group of the New York office of Sullivan & Cromwell LLP. Professor Molina’s practice focused primarily on the representation of institutions and their senior executives in a wide variety of criminal and regulatory investigations involving allegations of accounting fraud, securities fraud, foreign bribery and obstruction of justice. Prior to Sullivan & Cromwell LLP, Professor Molina clerked for the Honorable Robert J. Passero, A.J.S.C. Professor Molina was appointed to Associate Dean for Academic Affairs in August, 2017.